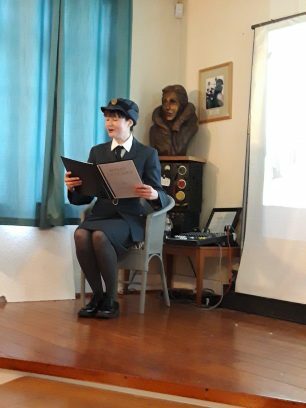 In a moving tribute to RAF Kenley, this month, the Kenley Revival Project have brought to the stage the true story of Lillias Barr, who was Kenley’s Assistant Section Officer of the Women’s Auxiliary Air Force in 1940. Her experiences of the Battle of Britain and Hardest Day raid are preserved beautifully in a publication Lillias wrote upon her return to the airfield in 1990. Our theatrical reading was performed by actress, Suzanne Marie, who is also a budding archaeologist and works on a variety of projects throughout London, and at the Rose Playhouse. 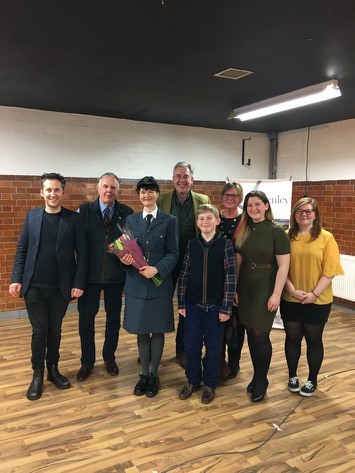 Thank you to everyone that came to watch the performance, thank you to Suzanne and Anthony who gave up their time for free to make the performance possible and thank you to the family of Lillias Barr, who gave us permission to use the publication which made this all possible. It has been such an honour for me to read your Mother’s words of her Kenley memories, and to interpret her experiences as a very brave young woman serving her country-doing her duty with great flair; humility; dignity; and with tremendous courage. In very threatening circumstances, your Mother had the courage to still find the joy of life-to have fun, and most of all-your Mother had the courage to love and to be loved, in a world that was at war with love. Your Mother faced the ‘Hardest Day’ with only the thoughts of the well-being of others. Your Mother did all that was asked of her, and thought not of her own heroism, but only of her duty. Her writings are very matter-of-fact about that, and this is what makes her heroism even more poignant, and beautiful. Your Mother’s modesty about her service and duty to her country, and of her love of neighbour, is profound beyond words. I strongly believe in my own duty towards all the many things which have been entrusted to me throughout my life, and my duty to your Mother’s personal memories, and my duty to honouring your Mother’s memory as Assistant Section Officer for the Kenley Women’s Auxiliary Air Force, holds firm and true with a loving heart-and very hopefully with a modesty and humility worthy of your Mother’s. I can only hope I would have made your Mother proud. I feel that through reading and interpreting your Mother’s words, I have come to know her and her vibrant personality. I have come to know your Mother’s generous heart and spirit; her courage; her sense of fun and daring; her very strong sense of right and wrong; and her steadfast belief in doing one’s duty. Your Mother was a remarkable woman, and I truly wish I could have met her. The path of love is always the most emotional one to take-and never the easiest, but ultimately it is only one we must take in this very brief and fragile life of ours. Your Mother never took life or love for granted, and the war only heightened her gratitude for both.